Washington State University launched the public phase of the largest fundraising campaign in its history on Dec. 2, 2010: a $1 billion effort designed to position WSU as one of the leading land-grant institutions in the world. President Floyd celebrates with Cougars in Seattle. 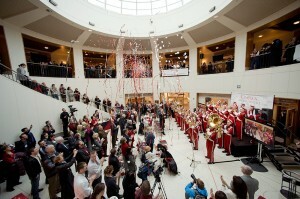 The Campaign for Washington State University: Because the World Needs Big Ideas seeks to reach its goal by 2015, the 125th anniversary of the University’s founding. More than 130,000 donors have committed $532.2 million to the campaign since its quiet phase began on July 1, 2006. Alumni, faculty, staff, students, and friends gathered today at the Washington State Convention Center in downtown Seattle, in the Terrell Library Atrium on the Pullman campus, on campuses in Spokane, Tri-Cities, and Vancouver, and in agricultural research and extension centers around the state to celebrate the public launching of the campaign. 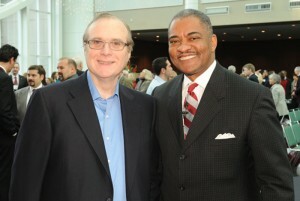 At the event in Seattle, University officials announced the largest gift in WSU’s history: $26 million from Microsoft co-founder and philanthropist Paul G. Allen to support programs and fund construction of WSU’s School for Global Animal Health. Gifts from other donors have supported professorships and chairs, scholarships, graduate fellowships, research and academic programs, and state-of-the-art facilities. Of the $1 billion campaign goal, more than $300 million is designated to support the student experience, with more than $180 million directly supporting student scholarships and fellowships. Nearly $250 million is sought to attract and retain outstanding faculty to teach and to conduct research. Key research initiatives, academic and outreach programs, and the construction and renovation of state-of-the-art facilities make up the balance of the campaign goal. 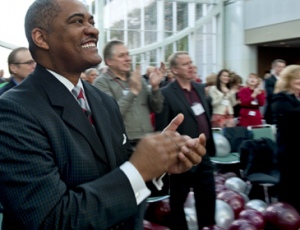 “With the generous help of our alumni and friends, Washington State University will be better at educating the leaders of tomorrow; better at serving the citizens and industries of the state; and better at conducting the research that will play a significant role in helping the world tackle some of the most vexing issues of our time,” Floyd said.